ColorTouch™ with WiFi for you mobile device. Qualification Statement on York Residential Equipment "Made in America"
Alliance air products is a specialty Hvac manufacture that can custom build almost any HVAC product. They specialize in custom Air Handling units to fit any application but also engineer, design and manufacture solar assisted units, Dx package ,data rack coolers, direct evaporator units, heat recovery, and direct replacement multizone units to replace Carrier (48ma & 48me),Lennox and seasons 4. Their customers include over 50 of the top fortune 500 companies. US Air Conditioning is the exclusive distributor for all of its territories. For more information call Mike Sabbaghian at 626-854-4648. Please watch the following Video to see what Alliance can really do. NEW!! WiFi access for the Venstar ColorTouch thermostat. 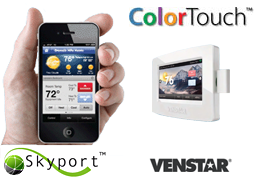 You can add WiFi capability to the Venstar color touch screen thermostat. Access your thermostat from your computer, iPhone, iPad, or Android; program, control & monitor temperatures and humidity and trouble shoot the AC equipment from your home, office or vacation home. You can even send a message from your Smartphone to your thermostat or have your thermostat send messages to you and or your dealer when it is time for service or the hvac equipment is not operating efficiently or about to fail. Dealers, contractors, school maintenance personal & building owners can control and monitor hundreds of thermostats. Visit www.venstar.com. View simple, foolproof installation instructions for WIFI thermostats. Also includes advanced features, trouble shooting & helpful tips. Color Touch wifi features view what you can do over the wifi with your smart phone or your computer. How to access color touch features on your computer or iPad. Visit US Air Conditioning's profile on Pinterest.